and they vary from one place to the other. Colchester Reef : http://www.erh.noaa.gov/er/btv/html/colreef.html Good conditions/on the lake : but not always given on weather station. Punctual conditions of winds on lake Champlain on VHS on 06 on the hour between 8 and 18 hours . ( in French summer 2004) are available thanks to a friendly network. That is the main reason for not being able to have good official wind conditions on the lake. The network is useful especially in bad weather. The operation network showed its effectiveness during the season 2004. More participants will permit better results. A few minutes of collaboration... more safety ... 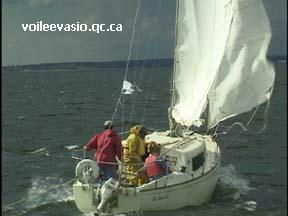 Important information : before hoisting the sails or in the course of navigation,..
A rapid barometer drop indicates stormy weather and rain ... Quick rise, after a low, change direction of wind, strong wind ± N/ NW, W, ... watch for large cumulonimbus coming from western part of the sky, from south to north.